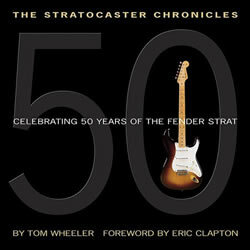 I found an interesting book on the Fender Stratocaster, by Tom Wheeler of Guitar Player Magazine. The world’s most famous guitar has a golden anniversary in 2004 and this official, authorised book/CD package offers the best photos, quotes, facts and sounds to properly celebrate this achievement. From Buddy Holly to Jimi Hendrix to today’s hottest players, the Fender Stratocaster defines rock ‘n’ roll for generations of fans and players. A foreword by Eric Clapton. Exclusive photos from the world’s greatest guitar collection. A CD with musical examples of famous Strat sounds and styles – even spoken excerpts from the author’s interviews with the Strat’s beloved inventor, Leo Fender.